When the editor of O Magazine asked Maya Angelou on how to write a poem she replied, "Like a pianist runs her fingers over the keys, I'll search my mind for what to say." Of course, Maya Angelou was a gifted poet so the task may have been an easier one for this esteemed woman of wisdom. With this in mind, I have spent several days allowing words to swirl in motion about the summer of 2014 and its offerings. on a stretch of blue weaving. they bid the beach good night. Bright, clear hues paint possibilities. Possibilities surface as the day draws to a close. I savor these last few days of summer. May you do the same. 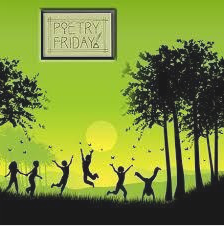 Join the fun of reading other Poetry Friday offerings at Check It Out. Jone MacCulloch is the host this week. Today, I woke with a feeling of hopeful expectation, still feeling the flow of positivity from last night's NYEDChat. Great energy set the backdrop for positive vibrations that rippled through the conversation. The topic, beginning the school year on a positive note, was just the right touch for those educators seeking a bit of inspiration. So it is natural to feel a sense of exuberance this morning. This type of a feeling cannot be matched but a short poem may be the right expression for my daily writing challenge. I dedicate the words swirling in my mind to the committed group of practitioners who joined the chat about positivity last night. With a collaborative spirit may you create a bright canvas for active learning this year! "The greatest impact on teachers is a collaborative culture." 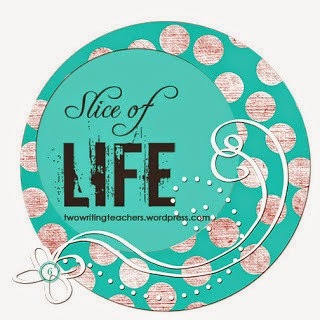 Join the Slice of Life community of writers today to read a variety of slices. than be stressed and fixated on deadlines and to do lists. Tonight I stopped long enough to hear the message of a beautiful song, "We celebrate, we believe!" that validates my summertime belief. With that song in my heart, I celebrate a beautiful ending to a week spent mixing relaxing moments with creative endeavors and work commitments. I took a family jaunt to the beach, strolled the boardwalk, wrote a piece for the Slice of Life Community, Summer Serenity Photo Essay Unfolds in an Upcoming Gallery, another for Poetry Friday, Summer Captures My Heart While Work Waits, conferenced about upcoming professional development workshops, and conversed with colleagues in various educational Twitter chats. Both the phone conferences and PLN conversations were rich and engaging - constructive buzzing about back to school topics and possibilities for a new year of learning-another reason to celebrate. One magical word comes to mind when I think of this week: positivity. To celebrate each and every moment. With that brief interlude I am now sparked to gather steam and dig deep into the work I need to do. May your upcoming week be filled with positivity. Join Ruth Ayres this week to celebrate her week's story ( a memorable one) and the reflections of others in the writing community. Have you ever just desired to linger in the moment and let the world pass you by? For me, this summer has been a perfect example of living life this way. 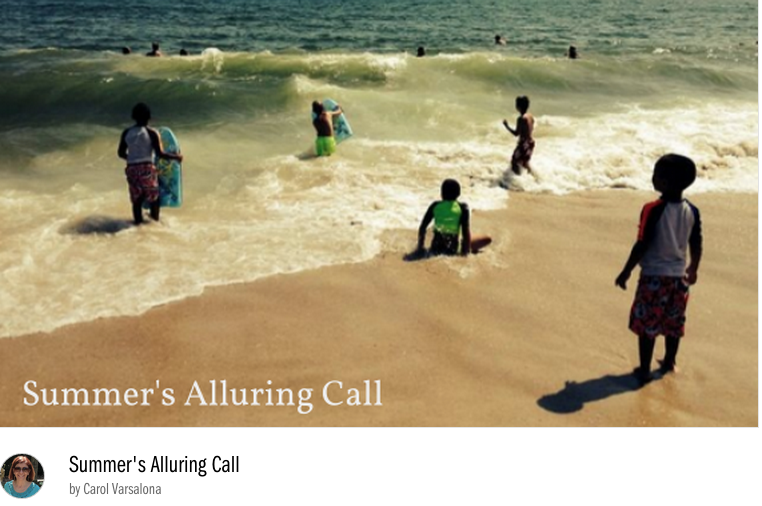 With the help of Mother Nature Long Island has been the perfect place for relaxing, reflecting, and recharging. 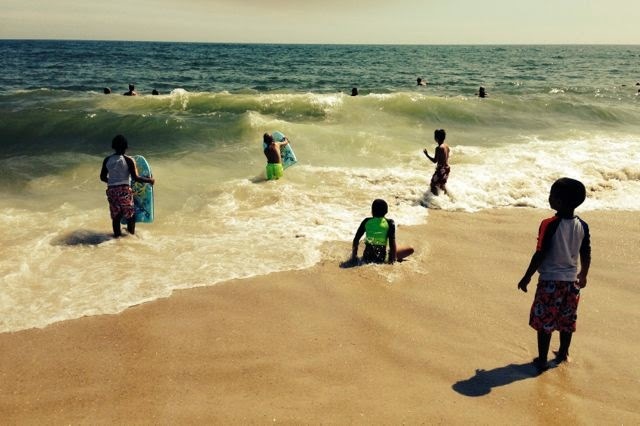 Moderate temperatures and sunshine-filled days have been the backdrop for the showcasing of New York's south shore Long Island beaches and seaside spots. Gardens have flourished! 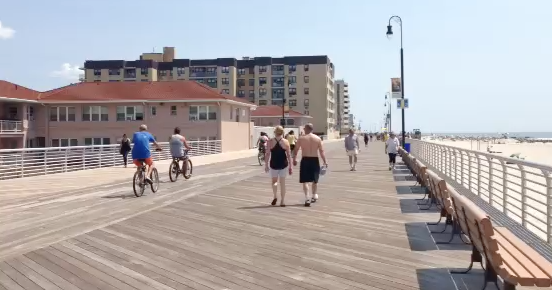 Boardwalks and trails have been filled with walkers, joggers, and bicycle riders interested in finding peace and balance with a mix of daily exercise. Outdoor cafes have been frequented. What more could you ask for? Even storms and power outages have not dampen the mood. Upon reflection, I can say that summer has been my time to listen to the earth's calling and live from the outside in while work waits for the in between hours. While musing over all of this and taking frequent jaunts to the beaches to watch the waves sparkle and play their oceanic games, I noticed a delightful poem in a aged book (1928), Poems of Youth Verse for Junior High School by Alice Cooper. As I leafed through this treasure the following poem spoke to me about the mood I have been in as of late. I wondered what the students from the late 1920s thought as they read this poem. Were they daydreaming about the sounds and sights of nature while in their classroom? (The poem is the first entry in the chapter titled "The Magic World.") After reading this poem, I found in the back of the book a section called "Study Helps." Would the same things which called the poet to go into the magic outdoor world lure you? Why did he go laughing? 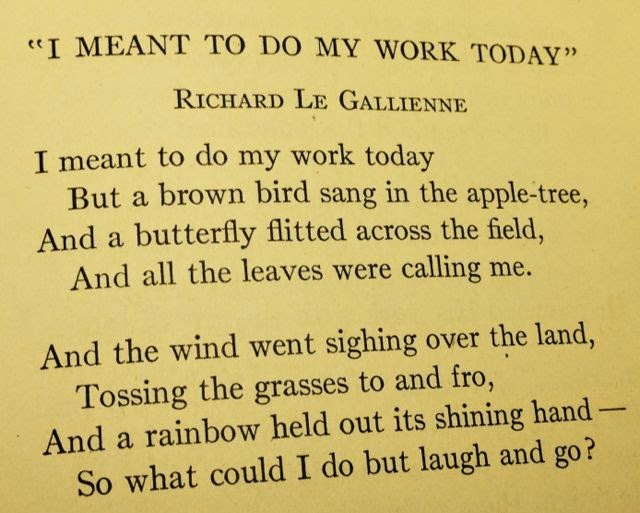 ...and so I go laughing into the world today but taking out some time to do my work. I rather sit and muse about life to let the day drift away but there are things to do and places to go as I prepare for my professional development programs and family visits next week. Enjoy your weekend and life! for the Poetry Friday Roundup. I awake today to a delightful coolness in the air and a slight bend in the trees as they stand regally amidst the sunshine. With a feeling of restful peace, I watch the scene outside my window spark my senses. There is quiet in the early morning hours. I listen to the sounds of summer and hear nature calling the season to start taking its final steps. But this does not sadden me. It moves me to a reflective place. I use the time to rethink the summer months, to linger in memories of uncomplicated, untroubled moments that recharged my energy. Hurried, harried times are removed from my thoughts today as I prepare to unfold a story of summer serenity in an upcoming online gallery. Photographs, poems and poetic expressions sit before me. My computer becomes the craft engine for combining each delightful submission through various digital tools. And so my day begins. The summer months have provided me with many hours of recollection and reflection. I connected through social media or in face to face settings with various writers, colleagues, photographers, and family, what I now refer to as the REFLECT WITH ME expression makers. 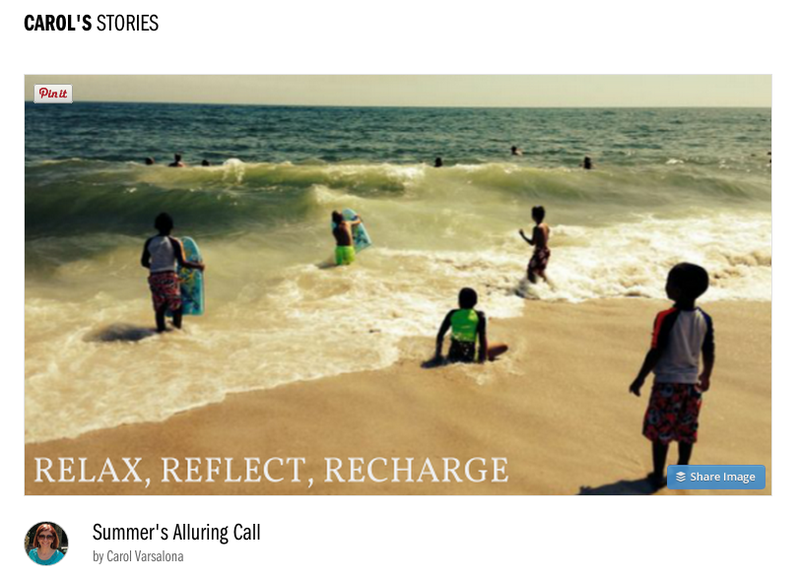 My story of reflective writing did not start here with Summer's Alluring Call to Relax, Reflect, Recharge. It began with a seed of an idea back in the winter months. The first online gallery of reflective writing, REFLECT WITH ME-Bringing Together a Community of Writers To Celebrate Life and Learning, was launched in March. Then, National Poetry Month spurred me on to create a second gallery, April Awakenings, featuring a growing community of reflective writers from across the United States and as far away as Australia. 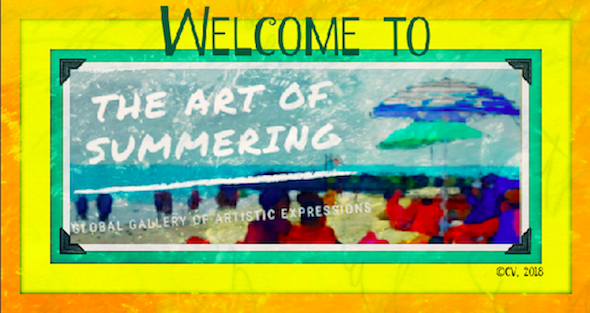 Because reflection is important in my life, I decided to expand the REFLECT WITH ME writing community to include a Summer Serenity gallery of artistic expressions. As the summer season embarks on its final weeks before school officially starts in New York State, it might be the time to savor your moments by capturing them in images and words. Questions pondered at the beginning of the summer still hold weight. Did summer provide peaceful scenes filled with calm moments? Were your days untroubled allowing for opportunities for restful reading? Did you luxuriate in the sun dipping your toes in the sand, journey to exotic locations, rest by rivers or in your garden, picnic in parks? An oasis of serene places beckoned us this summer. 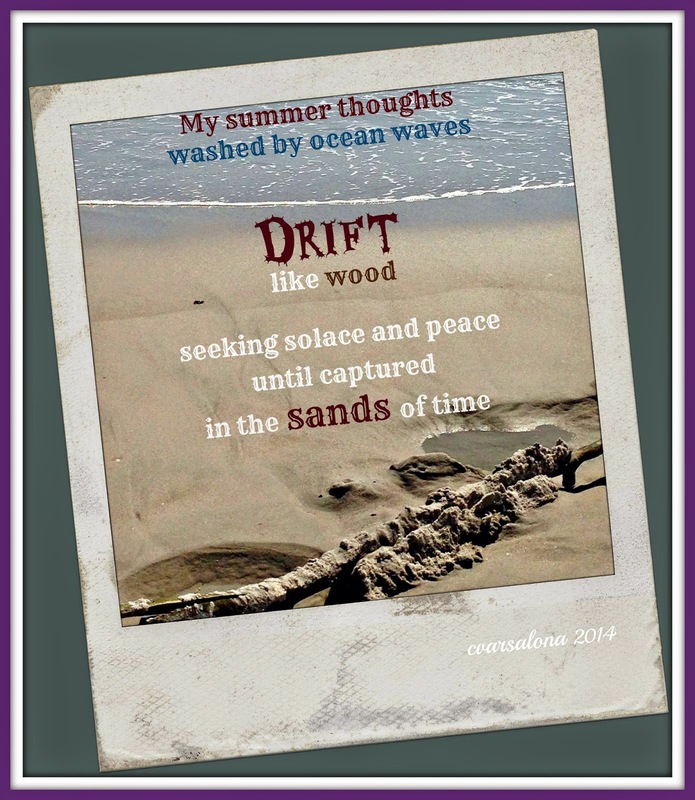 The writers of the REFLECT WITH ME community will share peaceful images and poignant poetic expressions that bring a sense of calm to what we like to think of as untroubled, uncomplicated summer days like the one I am having today. 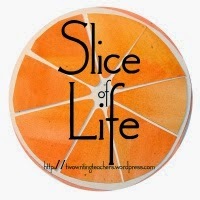 Each Tuesday, Two Writing Teachers sponsors the Slice of Life community. This piece will be posted to the site where you can read many other interesting slices. The fun begins here. You can also Tweet at #SOL14. 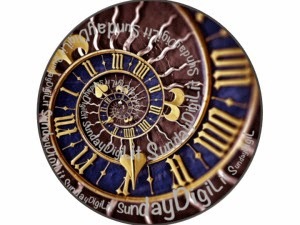 It is DigLit Sunday and this morning while conversing with the #spiritchat community during their Sunday morning Twitter chat all power in the house was cut off. What a quirky occurrence to happen just when I was ready to pen my DigLit post. Technology does have its glitches but offers so many fantastic connections for literacy integration. For the past week, I have been playing with the Tapestry tool that Margaret Simon, DigLit Sunday's host, introduced me to. Last week was my maiden voyage with the app. Last week and this week's offering is similar to a PowerPoint presentation but so much easier to create. I have been supporting an amazing educational opportunity in Uganda, Bigger Than Beads. 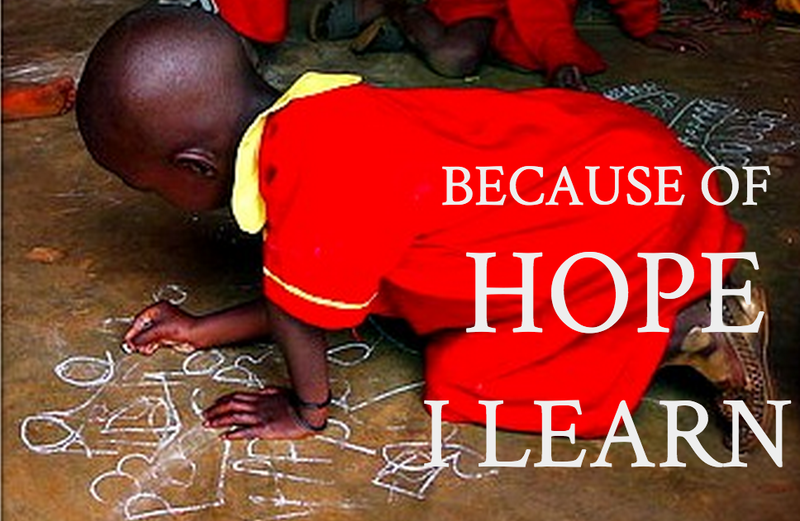 My blog post, Creating Hope From Paper, provides the background with a poem created from the photo of a Masese child that was sent to me. Today, I am attempting to unfold a story based on the post. Since I am a novice with this app, I welcome all comments and support to hone my skills at integrating technology with storytelling. 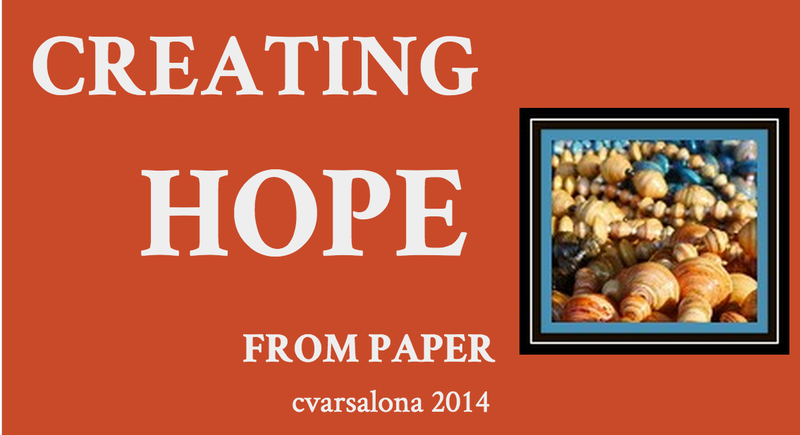 You can find the Tapestry story, Creating Hope from Paper, here. 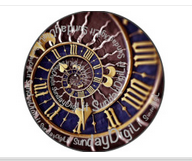 My second digital feat this week was to create a button for the REFLECT WITH ME Galleries that I posted here for March Madness and here for April Awakenings. Since I am so fond of mixing images with thoughts I decided that this button would be an appropriate one to represent the artistic expressions from across the world that are housed in the various galleries. The Summer Serenity Gallery will be unveiled at the end of this month. that should be posted soon. I have been been reflecting on the growth mindset this week to focus on how positive thoughts can affect change. Each day brought me closer to creating a visual image that expressed my idea. 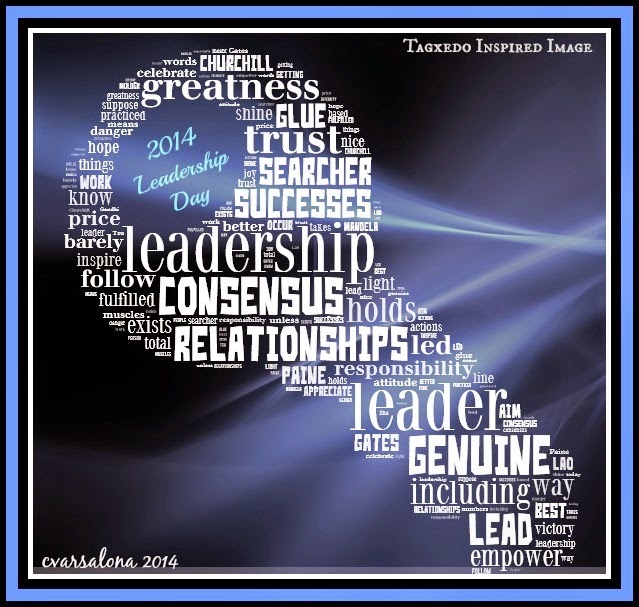 Yesterday, Leadership Day 2014, I started tweeting the image that I created with a free digital photo and PicMonkey. I was rather pleased with the combined photo and quote that I created and decided that I will use this in future professional development workshops designed for teachers and leaders. One Twitter colleague tweeted me that this will grace her office wall. You can imagine how special I felt that she considered this worthy enough for her learning space. I created this image to turn the table on failure. My advice for the week (that I am attempting to live by) is to accept the act of failing as a positive step for future growth. Although I do not have a specific classroom of students, the teachers and leaders that I present to make me acutely aware that we need to help students embrace learning as a messy process where failure is acceptable. We also need to celebrate the act of reflection and make it the go to action for stopping, pausing, and moving forward. This morning on #satchat there was a very lively conversation about embracing failure. Of course, this topic provided the opportunity to interject my own thoughts, especially the image I created. During the #satchat conversation, I had many sidebar exchanges that were stimulating, insightful, and provided "food for thought." a Twitter colleague, Joe Sanfellippo. @cvarsalona Agreed. I think it has a lot to do w/ ownership of the process. Kids want 2 do better & like the progression in that environment. 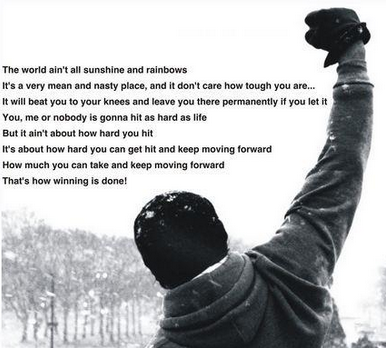 Then, the video clip of Rocky Balboa's inspiration speech to his son was sent out to all. Finally, Salome Thomas-El (@Principal _EL) twitted, "Building resilient kids is not teaching them to be successful...It's teaching them how to respond when not successful." Isn't that what it is all about? Celebrate all the events, big or small, and give encouragement when failure is evident. Teach the learner to reflect upon the misses and allow those experience to give rise to a new beginning. The spirit of resiliency will give the learner the opportunity to shake the dust off and try again. 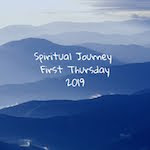 I am celebrating the connections, reflective moments, and opportunity to write this week. 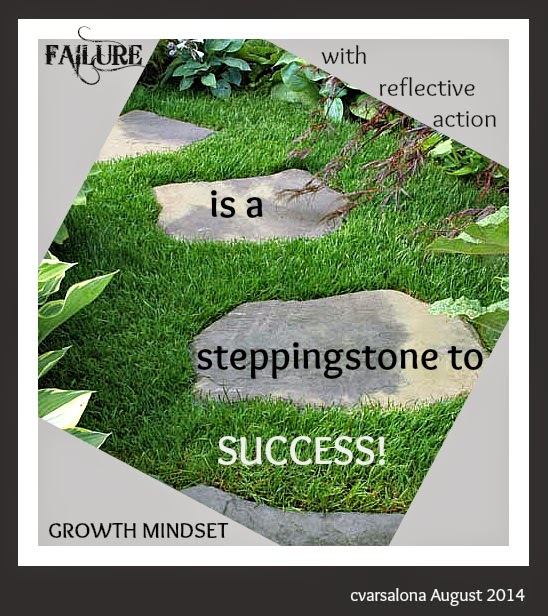 When I encounter my missed step I am going to be reminded that failure with reflective action is a steppingstone to success. This week you can read the blog posts of the writers who Celebrate this week with Ruth Ayres @ ruth ayres writes. We need to reflect upon the small moments of our week because those are the times that help us grow as learners. 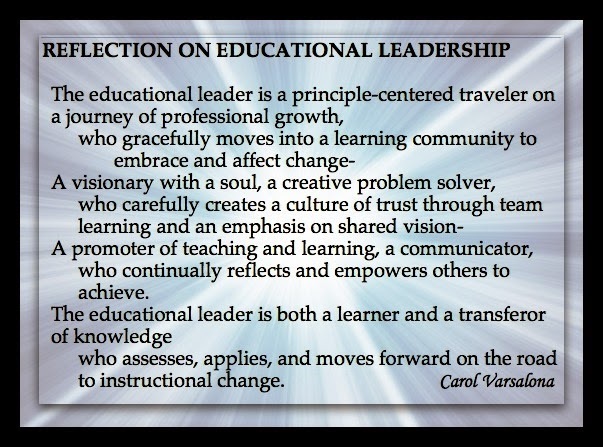 What is the essence of a leader? What do these quotes have in common? that work together for a common good. In order for change to occur, mind shifts need to happen. Cultures of trust need to be developed. 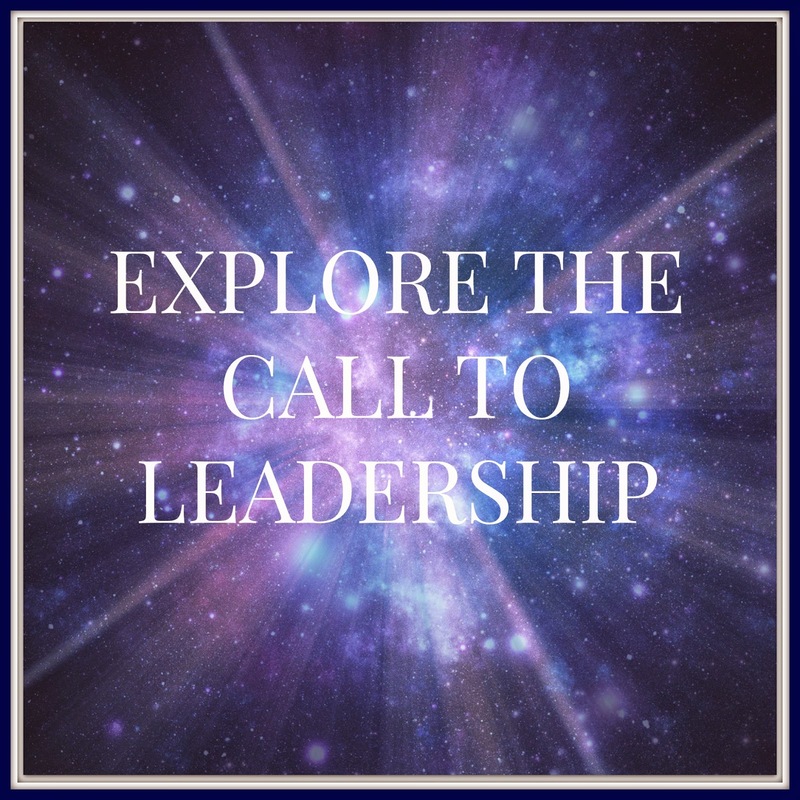 Leaders need to rise to the call of leadership. students are our investment in the future. Watching the glow of dusk moving over Manhattan's skyline elicits a range of emotions in the 9/11 post-years. As picturesque as an artist's rendering, the city spins a story of power, might, and perseverance. 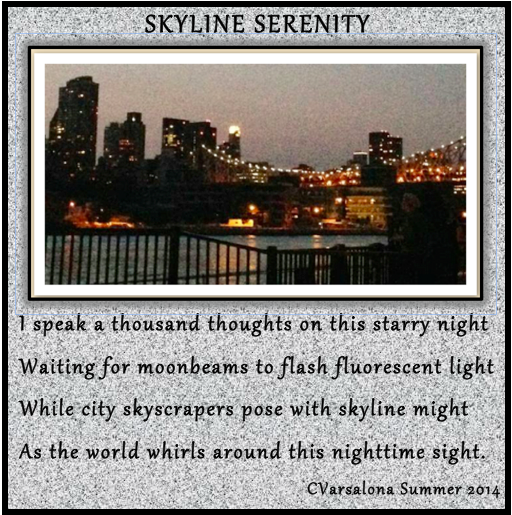 On this clear summer night there is a magical quality settling over New York City that inspires a writer to express her thoughts in poetic fashion. Listening intently to the sounds, observing the sights, and feeling the night's transformation from hurried hoofbeats to quietude, settles the hurt once felt in 2001. Broken into fine dust it spreads evenly over Ground Zero. Hope emerges from the bright lights of bridges, skyscrapers, and reflecting pools of water while stillness blankets the Manhattan skyline with a gentle softness. Quiet peace hovers over avenues and streets. A feeling of serenity is elicited. Travelers and city goers revel as words spin to form independent thoughts. Capturing a single scene in a photograph and blending it with expressive words is a collaboration of the heart and the mind. Combining two art forms, photography and poetry, opens channels of creativity releasing emotions and feelings. The sensations evoked are transferred from writer to readers and viewers. You can become immersed in this process when the REFLECT WITH ME: Summer Serenity Gallery is unveiled at the end of August. The scene below is one of many settings showcased in the virtual gallery. Engage in a close read of the photograph. Observe the setting and details. Focus on the underlying reason why the picture was taken. View the photo through a different lens enjoying the scene or making connections. 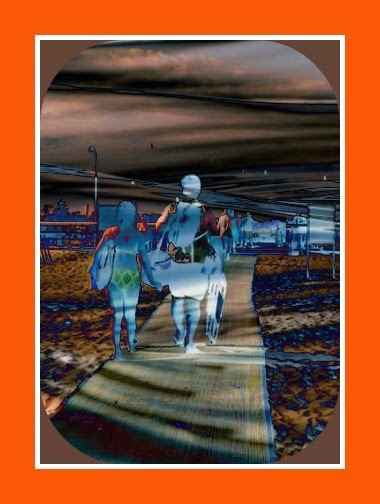 Read the poem focusing on how the words merge with the photo. Allow for a certain emotion to surface during the process. Question: What resonates in the pairing? Does the pairing of the poetic expression with the picture of a natural surrounding or man-made structure transport you to a place of stillness, even if it is for a brief time? Why should we engage in a viewing of a virtual gallery of artistic expressions? The Poetry Foundation believes that poetry should have a "vigorous presence in our culture." Marc Polonsky who wrote The Poetry Reader's Toolkit says, "Poetry is an imagination machine. Good poetry, given patience, lights up your imagination in some way. It surprises you, tickles you, gives you a nudge, or even awes you. It might reveal a new perspective, dazzle your mind's eye, broaden your inner vision." Finally, watch the late Robin Williams as John Keating in Dead Poets Society deliver his thoughts on Why do we read and write poetry? I hope you enjoy this short poem that I wrote while in New York City two weeks ago. You can hear the poem read aloud at Audioboo. This week's Poetry Friday is being hosted by my juicy little universe. Please stop by to read other submissions by a variety of writers. While feeling the sting of Robin Williams' passing, I found a quote by him that struck me as both sad and inspirational. The world is saddened by the death of Robin William, such a talented humorist and actor, especially in light of the fact that his multiple onscreen personalities provided endless moments of enjoyment for all. His words charged with humor brought laughter to the forefront. Little did we know that behind the movie persona, behind the words and ideas, was a complex character with deep issues. Teachers, stop and reflect: Perhaps, we need to step back this year and become better "kidwatchers" to understand the nature of each student. Will this reflective act help us find the words and ideas that can fuel individual learning? Will our simple words, our thoughtful actions change the world of the classroom for each learner? While rummaging through old journals, I found a poem I wrote for the millennium that still holds true for me today. These words although tucked away for years, provided the fuel for my teaching as 2000 brought new changes to the educational scene. 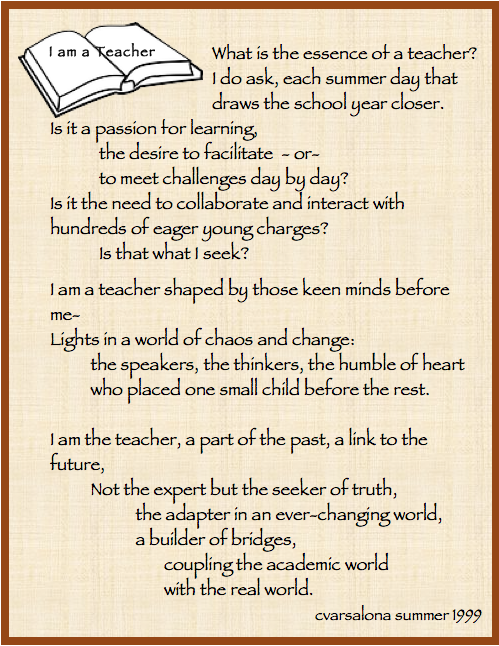 I would like to share this poem, thinking that my words and ideas from then may change the landscape of today's literacy classroom as I continue to focus on reflective practices in my life as an ELA consultant. This writing is part of A Slice of Life challenge from the Two Writing Teachers Community. You can read what other slicers are thinking about now if you take a stroll over to that site. This is the 2nd week that I have participated in Ruth Ayres' Celebrate This Week. I would like to thank Ruth for focusing on reasons to celebrate life before I begin to write. Sunshine cast a warm glow over Long Island this week, making spirits soar as July turned into August. Meteorologists cheerfully broadcasted the unusual weather pattern. Temperatures in the low 80s were reported, not the usual dog day heat of past years. Beaches were packed with frolicking children and adults were either surfing, bathing, or relaxing in the sun. Lifeguards' were on careful watch as high tides with rough undercurrents swept in and bounced shorefront beachgoers off their blankets and chairs. But this did not seem to stop swimmers from jumping in the ocean as the waves came close to shore. Back in my neighborhood, streets were filled with people interested in celebrating the good weather. Walkers had a sprint to their stride; bicycle riders traveled in pairs; children shouted as they played ball. Even the dogs were barking to a beat and one of the best spectacles of the week was a free parkway for traveling~clearly something to celebrate on Long Island. During this past week, I found myself pursuing activities that celebrated family, friends, and life. Now that the week draws to a close, I think of these summer days as gifts to be remembered - heartfelt memories that will flow in and out of my mind similar to the movement of high tide that I witnessed at the shore. That makes us want to spend more summer days thankfully building memories. After learning of the tool Tapestry from Margaret Simon, I decided to try to create a digital poem. My product is a modest attempt and will be posted to Margaret Simon's DigLit site where other posts about digital literacy will be collected. Just tap and see 3 slides. Since I thought I lost my first slideshow, I tried a 2nd one but I still need to practice to perfect my skill at creating digital stories. You can decide which presentation is the better 1st attempt. Let's hope this can be viewed.